When Jesus says “no one can come to me” Calvinists see the idea of Total Depravity (and specifically, total inability). When Jesus speaks about the drawing of the Father, Calvinists see this is as evidence of Unconditional Election. Calvinists infer Limited Atonement from the contexts of these verses. And when Jesus says that no one can come to Him unless it was granted to him by the Father, this is seen as proof for Irresistible Grace. So although this verse could be discussed under any of those other sections, it will be discussed here because Total Depravity forms the foundation for those other doctrines. Besides, Calvinists tend to primarily use these verses to defend Total Depravity. This statement is a universal negative proposition. It states a universal inability. The word can does not describe permission, but power or ability. To say no one can do something is to say they are unable to do it. The stark truth expressed by Jesus is that no person has the ability to come Christ on his or her own. For a person to be able to come to Christ, it must first be granted or “given” to that person to come to Christ. God must do something for us to overcome our moral inability to come to Christ. We cannot embrace Christ in the flesh. Without the aid of the Holy Spirit, we cannot come to Christ (Sproul, Grace Unknown, 136). Several things can be said against the Calvinistic understanding of John 6:44. First of all, what Jesus says is absolutely true: no one can come to the Father unless the Father draws him. However, later in the Gospel of John, Jesus states that the Father draws all people (John 12:32; 16:8). The work of God drawing people to Jesus Christ through the convicting work of the Holy Spirit is necessary. Nobody denies that. On our own, without this drawing work of God, no person would ever seek God or turn to Him. But saying that God draws all people is not to say that God regenerates all people, or even that, as a result of God’s drawing, people are unable to believe in Jesus for eternal life. As a result of God’s drawing work, any person can believe in Jesus for eternal life, as Jesus Himself states (John 6:40, 47). Does Drawing Mean Dragging? NO! Based on this, they may argue that sinners are dragged to Christ against their sinful will. Of course, this sort or argument is rarely used by Calvinists because it contradicts their teaching that once a person has been regenerated by God, their will has been irresistibly changes so that they come willingly to faith in Jesus Christ. Regardless, this sort of idea is not backed by the Greek either. While it is true that elkō can be used to drag someone against their will (cf. Acts 16:19; 21:30; Jas 2:6), when elkō is translated as “drag” it is always with malicious intent. When used in this way, it carries the connotation of mistreating someone or dragging them away for punishment (BAGD, 251). Clearly, Jesus is not referring to any sort of punishment or mistreatment by God in John 6:44, and so it cannot mean “drag.” Furthermore, this sort of dragging away for punishment is only when the word is used of a literal action. When elkō is used figuratively, as it is John 6:44, it refers to “the pull on man’s inner life” (BAGD, 251). 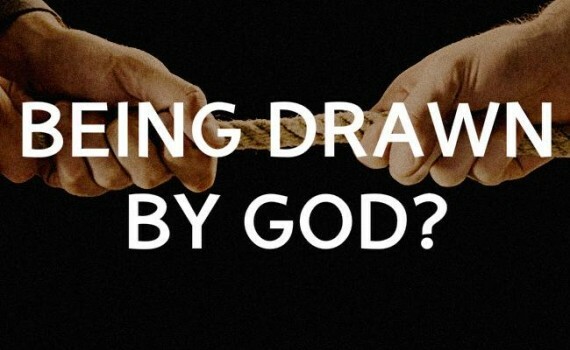 So the word “draw” in John 6:44 refers to God’s pull or persuasive influence upon the heart and mind of the unregenerate. Support for this understanding is found right in John 6:45 as well where Jesus says that all will be taught by God. This is another way of explaining the work of God to draw people to Himself. This teaching from God is carried out through conscience, creation, the convicting and convincing work of the Holy Spirit, and through special revelation such as that found in Scripture. Of course, not all who are drawn or taught by God respond positively to God. Those who hear what God teaches, and learn from it, will respond by coming to Jesus in faith. This idea is supported by both Peter (1 Pet 1:23) and James (James 1:18), both of whom write that hearing and responding to Scripture is part of the process which leads up to the new birth. In response to this, Calvinists will sometimes argue that if all are drawn by God, then all will receive eternal life from God. But to say that all who are drawn by God are also regenerated by God is to confuse offer of eternal life with the actual reception of it. Just because God draws, calls, woos, or invites all people to believe in Jesus for eternal life, this does not mean that God universally and irresistibly regenerates all people. Though all are drawn, eternal life is given only to those who believe. Does All Mean “All Children of God”? Furthermore, some argue that the “all” of John 6:45 refers only to “all children of God” (Piper, Five Points, 27-30). They often go on to say that Jesus can only be referring to the children of God since Jesus says in John 6:46 that no one sees God except him who is from God. Of course, this is reveals a terrible misunderstanding of this text as well. Jesus is not referring to the children of God in John 6:46, but to Himself! It is He who has come down from God, just like the manna in the wilderness (John 6:41, 48), and therefore, His words can be trusted, and in His words are life. John 6:44 then, far from being verses about exclusion and inability, are staggering statements from Jesus that in Him, all are accepted, all are invited, and all are welcome. Jesus has come down from heaven, not to start another religious club for a secret set of special chosen ones, but to throw open the door to God for all people. Jesus has come to reveal Him Whom no man has ever seen, so that through Jesus, God might draw all men to Himself. God desires that all people have life, and so God sent His Son, Jesus, into the world, so that in Jesus we might see God, and might believe in Jesus for everlasting life. It has a certain ambiguity – draw me after thee we will run. This is an argument for the response, willing and able, to the wooing and to the love. Interesting. I did not know that. thanks! Is it proof of predestination rather than TD ? The reason we come to the Messiah is because we are called by God, we cannot come if we are not called. Yes, this verse is very often used to defend predestination as well. my question is what does the Bible teach if it is not teaching about man’s inability? How much of a role do we play in our salvation. the reason I ask this is because I don’t believe in universalism nor do I believe that God left the decision totally up to us. Paul, that is a good question. Our eternal life is not earned or merited by us at all. Not one iota. It is all due to the grace of God and the finished work of Jesus Christ. The difference between those who have eternal life and those who don’t, is that the first group believed in Jesus for eternal life. But faith is not meritorious; it is not a work. Therefore, it cannot be said that by believing we contribute to our eternal life. If Bill Gates gave you $1 million to help feed the poor in your community, and you received this gift from him, could you in any way say that you receiving the gift is a contribution to the gift? Of course not. Receiving the gift in no way contributes to the gift or diminishes it. So also with eternal life. In this same context we see the appeal to believe by Jesus (6:47). All are invited (John 6:44), and the ones who believe possess eternal life. yep. Good summary. Thanks, Dwight! Jeremy: Thank you for a concise explanation of John 6:44. Your parsing out of this important verse is spot on. God’s provision of grace is just that — a provision, or, as Webster describes it, “a measure taken beforehand to deal with a need”. God’s offer of salvation is just that — an offer which, by definition, requires a response of either acceptance or rejection. God has equipped all humans with the capacity to feel guilt, remorse, humility, pride, conscience, etc. If we are not capable of willfully responding to God’s amazing offer, then these feelings have no meaning or purpose in any of us. R. C. Sproul is precisely correct when he states, “Without the aid of the Holy Spirit, we cannot come to Christ.” I point to his use of the word “come” with the sense of “willfully take action” by placing our faith and trust in the redemptive work of Christ. Thus, faith is not a gift. Faith is not something you have, it is something you do. I imagine Sproul would take great exception to my understanding of John 6:44. But I like how you bring out the areas of agreement. At the same time, I am not sure I would say that faith is something we “do.” But it not a gift of God, either, as you point out. I am searching for a different way of explaining faith, but haven’t come across it yet…. Putting so much reliance on one verb (‘can’) is not a good foundation for a major theological position. As an editor, I spend a lot of time asking people what they meant when they wrote ‘may’ or ‘can’ because the two are used interchangeably in modern English. Do you think the Greek in the original text had the distinction in there? If 2. is true then it is God who has given us in our nature the ability to respond. If 1. is true it is God who gives us the ability to respond in spite of our nature. The controversy goes back to Pelagius who said that because we could be good (by a grace given to all humanity) we should be good. TD solves the problem of Pelagianism by saying that it is impossible for us to be good so it is only by God’s grace that we can be good. But we only need TD if we take things to the extremes of Pelagius. Yes, that is a good summary of how this interpretation developed. I think Pelagius was wrong, but I don’t think Augustine’s rebuttal was any better. I think the solution lies in a different understanding of faith. If faith is non-meritorious, then we can say both that faith is not a gift AND faith is not a work, and yet still say that humans can respond by faith. I currently do not have a good way of explaining this, but am searching…. any ideas? It seems to me that faith has nothing to do with merit. It is neither meritorious nor non-meritorious. To be one or the other, would make faith into an object that we somehow acquire from some outside source, whether earned or unearned. I liken faith to be more like love. Love from my heart is not an object to be acquired like a new hat. And neither is faith. They are both God-given capacities of human nature that we are all born with. I said in my earlier comment that “faith is not something you have, it is something you do”. By this I mean that faith, like love, requires taking action — doing something. That something is deciding where or in whom to PUT or PLACE my faith. We often say, “I have faith in Christ.” But what we are really saying is that “I have consciously decided to put my faith in Christ.” Thus, I believe Brian’s #2 to be true but that does not make his #1 totally false. We are, indeed, utterly incapable of responding in our fallen condition UNTIL we are made aware or this condition by the wooing and convicting work (calling) of the Holy Spirit. I like this explanation. I also think of faith as something like love. Yes, it is a God-given capacity that happens to us. Faith, like love, is one of those things that is difficult to explain what it is and how it comes about. This illustration has been used in the TD debate; A man lying helpless in bed is given his medicine on a spoon. He is utterly helpless but he still has to swallow the medicine. TD advocates say ‘No! he is dead in his sins he cannot even swallow, God needs to make him alive before he can swallow’. The whole argument hinges on what ‘dead in trespasses and sins’ means. Paul uses the idea of death in many ways e.g. he says that death was working in the apostles but life in the Corinthians 2 Cor 4.12. Does he mean that inability was working in the apostles? No. So we cannot say for sure that ‘dead in sins’ implies inability. But what real difference does it all make? Moderate Calvinists are not much different from moderate Arminians. We need to avoid the extremes. Little children keep yourselves from idols. Moderate Arminians avoid Pelagianism by admitting a degree of inability. The man on the bed is paralysed but he can still swallow the medicine of the Gospel. For me I cant really see what is at issue. A moderate calvinist still believes that the medicine needs to poured into the patient’s mouth but that the patient is dead and needs to to made alive before he can swallow. Thus two camps are being made on what happens in the moments after the gospel is preached. Does the man use a vestige of ability and swallow or does God make the man alive so that he can swallow. Both camps agree that the medicine needs to administered and both agree that God needs to be calling that individual to respond. It seems like angels on pinheads to me. Jeremy: You mentioned that faith and love are kinda hard to explain, and of course (as you do so well) you made me think about it. At risk of being labeled “well duh”, hare are some thoughts to consider. If we add to faith and love, justice, mercy and truth, we begin to approach the essence of who and what God is. In His perfection, His faithfulness in unfailing, His love is boundless, His justice is impartial, His mercy is unfathomable, and His truth is untainted. Being made in his image, all mankind has been endowed with these same traits. Unfortunately, in our fallen condition we too often mess it up. We misplace our faith in wrong things, we love conditionally, we judge unfairly, our mercy is mixed with spite, and our truth is gray. Unlike physical abilities, these mental capacities cannot function by themselves. At least one other person is required. In a philosophical sense, faith, love, justice, mercy and truth cannot exist in the absence of a second party. At best, they would just be useless ideas without value or purpose. But the moment a second person is added to the equation, faith, love, justice, mercy and truth explode with glorious meaning and potential. And, perhaps, this begins to answer the why-are-we-here question? But that’s another discussion. Excellent, excellent points. I have recently been challenged by Michael Hardin to rethink what makes a person. He has said, much as you have, that a person cannot exist in isolation. Personality is the interplay of two or more people. So faith, hope, love, truth, justice, etc, are how two are more people interact with each other. I really like the directions your thoughts are taking you. Keep it up! I was raised a staunch supporter of free will. How anyone could believe that we were just robots, or worse, like those fatalistic religions that act like maniacs and blame their god for any negative consequences? I had only had bad experiences with radical Calvinists, so I never even considered their point of view. In fact I have never read any of Calvin’s works or studied any other predestination materials to this day. I don’t know anything about a tulip or just how many points of Calvinism there are. Is it 3 or 5, or is it 7? Who cares? However, one day I was reading the Bible and as I carefully and quickly skimmed past the word “predestination,” I wondered what I was so afraid of. Shouldn’t I just read the Word for what it is, without any preconceived ideas? Over months and years, I started “collecting” verses that overtly express the idea of predestination and I was really surprised that there were so many. They seem very specific and in your face. Somehow the free will verses seem a lot less specific and really circumstantial, open to interpretation. I still can’t say whether I am one or the other, likely neither completely. However, just based on the in your face predestination (an actual word in the Bible, unlike free will) verses and stories, if my salvation depended on it, and it doesn’t, I would have to go with predestination based on Romans 9 and Ephesians 2 specifically, plus many other verses of course. Romans 9 lays it out pretty clearly. Abraham was chosen, O.K., he might have been a really good guy. Isaac was chosen. Sure he was the son of Sarah. However, Jacob was chosen before he was born, before he did anything good or bad. And to be completely honest, Essau was a much better guy, which God already knew. He made one frivolous mistake when he was tired and gave up his birthright. On the other hand, Jacob was conniving and cowardly, but chosen nevertheless. Paul is literally laying out a specific case for predestination. The chapter seems to give very obvious examples of predestination and tells us sternly to not question the matter by saying “Who are you, a mere human being, to argue with God?” It’s a very difficult passage for the free will camp to be sure. Then you have Ephesians 2:7. It describes an amazing scene in some future age when all of this mess is left far behind. God is displaying the Church in this future age (likely to the spiritual rulers mentioned in Ephesians 3:10) as examples of His mercy and love (and in 3:10, wisdom). The Church is an example of God’s mercy for His glory alone. If this is true, then any part we can play in our own salvation takes away from that glory. Can you imagine us all standing there finally understanding just how loving and merciful God is, giving Him all the glory? The spiritual rulers are also in awe looking down on we puny humans and God’s mercy towards us expressed in all clarity and purity. Now imagine a free willer standing up, clearing his throat and saying, “Well, God, you did die for me and save me and all that stuff, but I chose it!” Even choosing salvation means that we deserve some credit for what God did for us, which negates the definition of mercy in the first place. Matthew 7:22-23 mentions a group of people talking about their virtues on judgment day. It didn’t go well at all for them. They should have been extolling the virtues of Christ that they depended on wholly. There may be room somehow for both, but to fall firmly in one camp seems really naïve. The greatest theologians through the ages have argued about it and are still arguing about it. No matter which way we lean, we have to make at least a little room for the other view in this case. Even better, just preach Christ and His power to transform lives and avoid the subject altogether! If I continue this series on Calvinism, I will get to the question of predestination and how I understand those passages that refer to it. Cool, I would be interested in another angle.